Home › Barack Obama › Can the National Hurricane Center shoot down storms? Can the National Hurricane Center shoot down storms? Robert Johnson’s Business Insider article shed light on an extremely large purchase of ammo by the National Weather service. 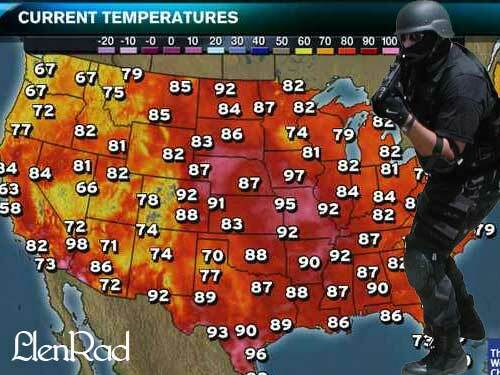 Gun rights and gun control have been all over the news this year, I wonder how people feel about federal weather men getting more ammo than Arnold Schwarzenegger in Commando. If the National Hurricane center has figured out a way to shoot thunder storms out of the sky then that would explain the purchase of 46,000 rounds of bullets this year. If you can pop off some shots in order to really make it rain then I guess you actually need tons of .40 caliber S&W rounds. I understand however there are STILL many, many people who find it HARD to believe that anyone can shoot a hurricane out of the sky, with a bullet. Damn NON-TRENDIES. Just for the sake of arguing all potential options should be considered right? How else could we solve this mystery? 1. They are defending Americans from terrorists. That’s right if anybody has the courage, training, and background to hunt down dangerous terrorists it is the weather man. Who else can handle HIGH and LOW atmospheric pressure better? 2. They need protection from the pre-paid weather mafia. After doing a number of under hand deals where they have been taking money for weather they got behind on a couple of payments and have been receiving threats from the weather gangs. I guess the feds have to do what the feds have to do. If The Prime Thug said the weapons needed to be bought for his “operation” then they better be mutherfkn bought. Who’s gone stop him? He’s the Prime Thug. What do you think? Why in the world would the weather man need so many rounds of bullets? Do you think that TAX PAYER MONEY could have been better used? ‹ 3 signs Prince Harry and his family have recolonized America.